Archivists and conservators at the Municipal Archives face many challenges in their work to preserve and provide access to the City’s historical records. 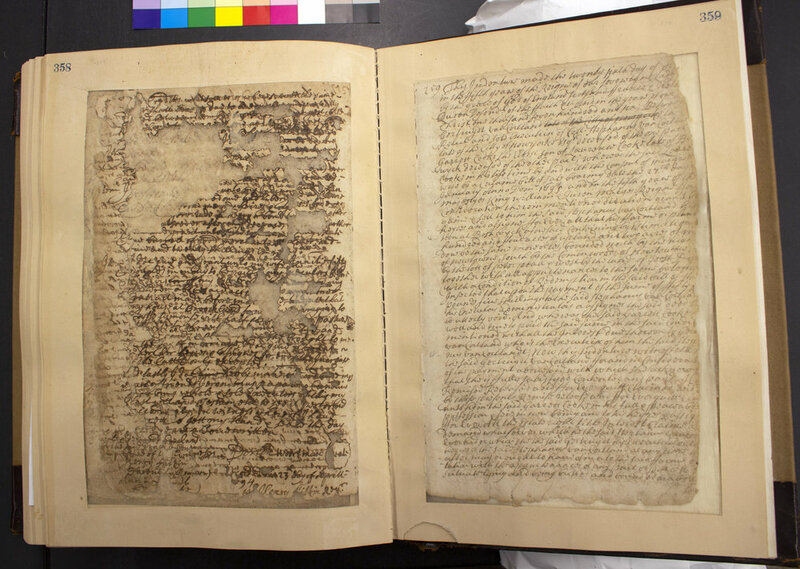 This week’s blog discusses the effects of the iron gall ink used to create some of the earliest documents in the Archives collection. Example of "burn through" in an untreated page with iron gall ink. Iron gall ink was the ink of choice in the Western world for well over a millennium. Its indelibility and rich dark tone were desirable traits for artists, scribes, letter-writers, bookkeepers, i.e. virtually anyone documenting something on paper. While other types of inks were also available, such as carbon black and lamp-black ink, iron gall made up a significant proportion of the inks used up to the early 19th century, tapering off rapidly after that time. Iron gall ink, however, also has the unfortunate trait of damaging the paper it is written on. Over time and depending on certain conditions, the ink can fade to a light brown, create a haloing effect around letters, or “sink” through the paper. The ink in extreme cases will corrode the paper support, leaving areas of losses resembling burn marks in the paper. The effects can be seen in drawings by Leonardo Da Vinci, early drafts of the U.S. Constitution, and manuscripts of Victor Hugo, to name a few. The ink poses a formidable challenge for institutions with pre-19th-century manuscripts in their collections, including the Municipal Archives. The effects of iron gall ink have long been known to conservators but are still not fully understood. The ink is composed of four main ingredients: tannins, which come from oak galls—a growth triggered by parasitic insects that attack oak trees; iron sulfate in the form of bluish-green salt crystals; a binder, usually gum arabic from the acacia tree, added to improve the flow of the ink; and lastly, water or wine. The ink achieves its rich bluish tone after the solution is exposed to air while writing. Research has shown that the two main ingredients in the ink, iron salts and tannic acid, each pose separate risks to paper, risks that are exacerbated by certain environmental conditions. 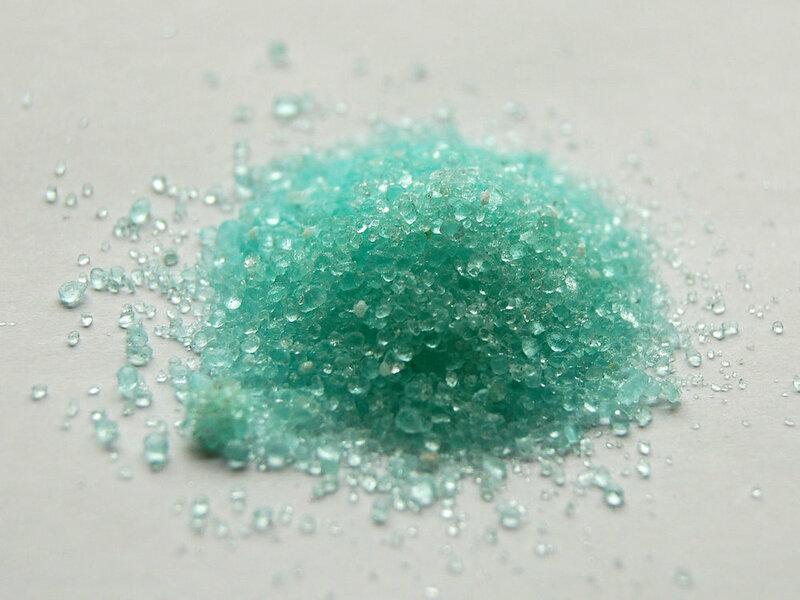 The concentrations of the ingredients, the preparation method, the presence of other contaminates in the ink such as copper or zinc, the amount of ink that is absorbed into the paper, and even the type of writing instrument used, all influence and further complicate the degradation process. As a result documents that are produced at roughly the same time may exhibit a wide range of condition levels. This variability is easily seen in the pages of manuscripts in which one page appears stable, while the adjacent page may show signs of severe degradation. In these cases it’s possible that the writer used a new batch of ink on the adjacent page or a new writing instrument, or even perhaps a new writer with a much heavier hand stepped in on the following page. It’s often impossible to say. These numerous factors, of course, complicate the role of the conservator, who must determine the best approach to treating and preserving collections. 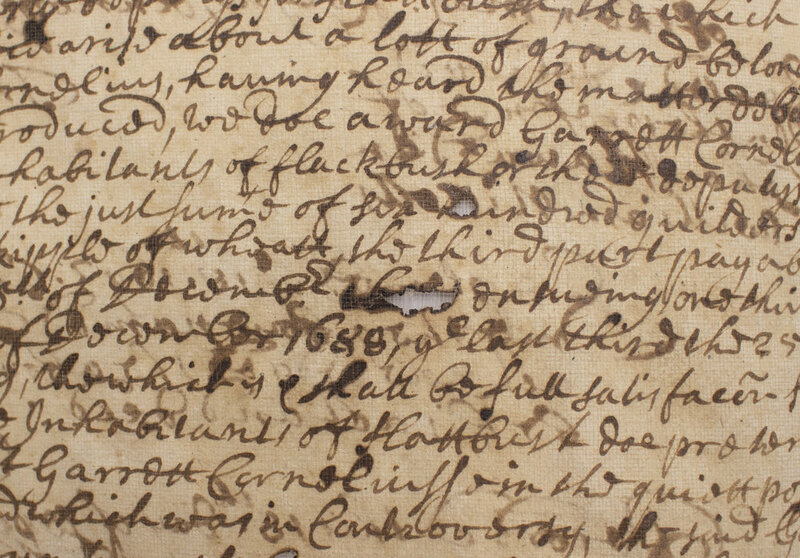 Book of 17th-century land conveyance records showing the variability in condition of different pages. NYC Municipal Archives Collections. In some of the Archives’ original Dutch and English records, which document the founding of New York City by Dutch colonialists in the mid-17th century and the subsequent English takeover, the wide-ranging effects of iron gall ink are on full display. Some of the Dutch records were treated by Archives conservators in the late 1980s by a process called leaf casting. The treatment involves filling in losses on a damaged sheet via a water bath with new paper pulp. The water is slowly pumped out, allowing the pulp to fill in any missing gaps in the original document and create a more stable structure. The treatment also washes away water soluble iron II ions and acidic elements in the paper that contribute to its deterioration. Dutch records that were treated by leaf casting in the 1980s. NYC Municipal Archives Collections. The documents that underwent this treatment more than 30 years ago are in markedly better condition today than those that have undergone no treatment. While leaf casting does not address the full range of issues that iron gall ink brings—a near impossible task for conservators racing against time and often less than ideal storage conditions—it has certainly proven to have been a worthwhile approach that likely prevented significant future losses. The treatments available for collections with iron gall ink continue to evolve, as more research is conducted. And, additional options have been developed since these collections were treated years ago, such as a calcium phytate/calcium bicarbonate treatment. Municipal Archives conservators will continue to monitor the remedies for these important materials.